Alex drives the car over the starting line and prepares to climb the hill. The team puts the finishing touches on the car after replacing the blown batteries. The team poses with the car at the end of the event. A week of hard work pays off as SunStang reached the track on two of the three race days. The last day of racing had arrived and Sunstang was hard at work getting the replacement battery pack assembled and into the car. There was no talk of throwing in the towel just the sound of everyone pitching in for the team in order to get back on the track. By noon the team had the car assembled once again, camel-backs were filled, radios turned on and Alex was driving the car out of the garage and back onto the track. The team lined the pit lane as he began gaining speed and heading towards the towering hill at the end of the pits. Perhaps moving a bit more sluggish from the extra 60 Kg of batteries the car began working its way up the hill; looking like an ant compared to the mountain it climbed. But despite the weight, the black form of the car glided over the top of the hill and around the corner out of sight. Things were looking up for the team as they watched the car cross the finish line for a second lap; then a third and a fourth and a fifth. With each new lap the team’s excitement grew yet with each successful climb of the hill the feeling of success never faded. But this was not meant to last as at the end of the fifth lap the driver Alex saw wisps of smoke rising over the steering wheel. A moment of panic swept the team as they looked on as Alex threw open the canopy at the start of the pit lane and leapt from the car. Soon everyone was running towards the car, fire extinguishers in hand, fearing the worst. But these wisps of smoke turned out to be simply a fried Arduino in the steering wheel, a simple fix. This simple fix soon turned out to be a more difficult problem than initially thought. The board was shorting when in contact with the steering wheel interior and eventually the board had been removed from the wheel and taped to its outside. As race time quickly ticked away a temporary Band-Aid solution was all that could be done. A new driver, Jeremy, was quickly into the car and gliding down the pits bound for the track once again. As with every lap before the entire team watched with bated breath as the car rose up the hill and smiled as he climbed the mountain once again, but that success did not last long as mid-lap Jeremy saw the board burn-up once again. He was soon stranded on the track. With only a short while before the race officially ended that was the last time on the track for SunStang at FSGP 2017. 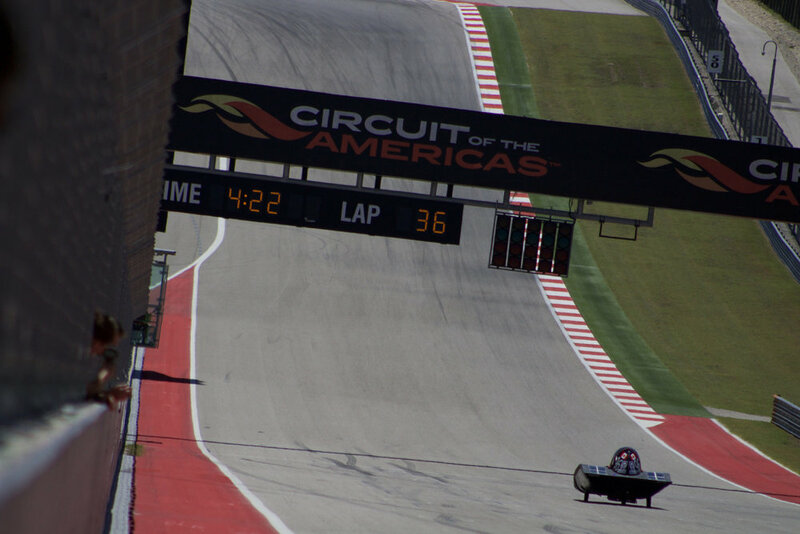 However, despite the challenges of failing batteries and steering wheels, or the heat and sun which beamed down on everyone all week, the team was extremely proud of what had been accomplished and enjoyed their time in Austin. The team had qualified for the race unlike the team’s last trip south, and completed multiple laps without pushing the car over the hill. Compared the old car, stuck on the hill and without a lap to its name, this year was much more successful and a good building block for the team. From this past week, the team can go back and correct small issues such as the shorted steering wheel, something which will make this car much more successful in the future. As well, looking forward this has been an excellent learning experience for the whole team as they begin to plan out the design of a whole new vehicle. All in all, FSGP 2017 has been another amazing adventure and one that everyone on the team who travelled down south will always remember. We welcome you to continue following the team as we look to expand on our successes and learn from our mistakes to further grow as a team. After all, the sun never sets on SunStang.